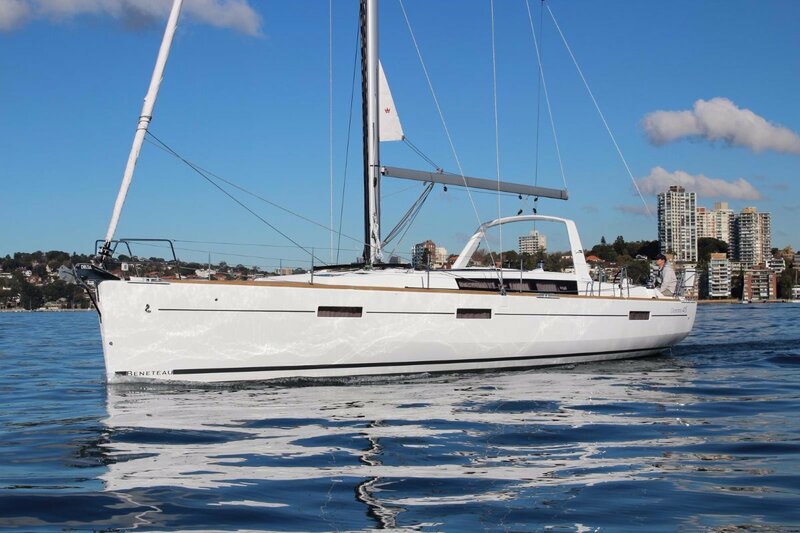 Elision was launched in May 2016 and presents the best opportunity for a buyer wanting a stunning Beneteau Oceanis 45 ahead of summer 2016. Elision sports the very latest 3 cabin, 2 head light oak timber and leather interior with not seen on any Oceanis 45 in Australia before giving her individuality and an amazing modern look. A classic white hull was chosen with beautiful teak decking on the side decks and cockpit. The specification is considered and classy with notable options such as the 2016 exclusive package, a comprehensive B&G electronic package (pilot, B&G wifi, AIS, 2 x 7" Zeus at each helm plus a large 12" Zeus plotters), upgraded Fusion DVD/Bluetooth stereo system, varnished deluxe cockpit table with swiveling plotter plinth, electric heads with holding tanks, flat screen TV in saloon on bracket, 2000W inverter, microwave and remote control electric transom. Maneuvering and docking is made easy with the bow thruster, double bow roller, 6 large mooring cleats and anchor pack with up and down windlass control at helm. 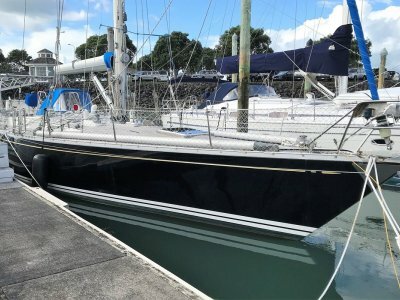 Whilst Elision is very fast and capable of racing with Cat 7 safety gear, carbon spinnaker pole and folding propellor, she has been set up with effortless leisure in mind. 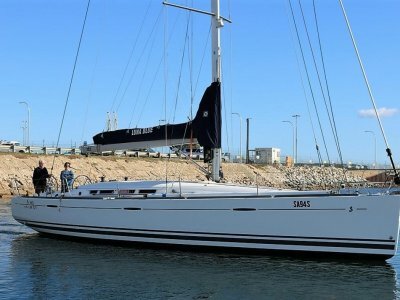 Options such as electric primary winches, in mast furling are fitted along with a self tacking headsail rail and rigging. 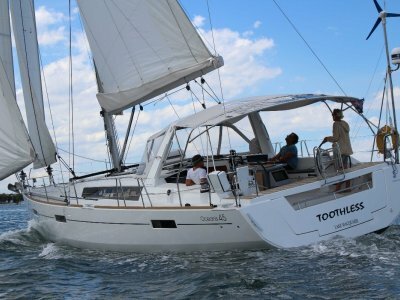 You can enjoy the standard 105% headsail when racing or the brand new North high spec self tacker when cruising with friends and family. Elision is valued at over $600,000 to replace and is around 6 months ahead of a replacement. 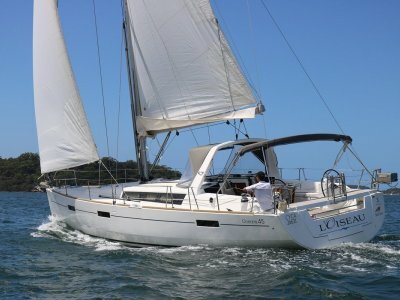 Her owners are reluctantly selling due to life changes and therefore this fine new vessel is offered to you. Wheel and cockpit table covers. 3 cabin, 2 head version in new light oak. Dark laminated flooring. Off white leather upholstery. 2 fully enclosed showers in each head. 1 H&C transom shower. L shaped galley conveniently below the 45 degree sloping companion way. Plenty of storage and good bench space. Microwave fitted. 1 85 litre top opening 12 V plus 130 litre front opening. Deluxe 3 x gas burner stainless steel stove with oven. 6 fenders. 4 mooring lines. 12 V - 1000 W Vertical electrical windlass with remote control and chain counter in cockpit. Upgraded double stainless steel bow roller with bob stay. Category 7 for 6 people. 12 and 220V circuits. 60A batter charger. 2000W inverter. Battery monitor. Extra power sockets in cockpit lockers. B&G wind, speed and depth. Wifi interface. VHF radio. Fusion system with DVD player and bluetooth. Saloon and cockpit speakers controllable via B&G plotters. Elvstrom upgraded mylar tri radial furling mainsail. Elvstrom factory 105% dacron furling genoa. North Sails Norlam high spec race sail. Double aft swept aluminium optimally centred furling mast. Wire rigging. Carbon fibre spinnaker pole with rigging. Self tacking headsail rail with rigging. Harken electric primary and 1 coach house winch. Spinlock clutches.